Despite still being August, there has certainly been a hint of autumn in the air this past week, with rather chilly, fresh mornings and the first mushrooms starting to appear in the forests. Summer is, and will always be, my favourite season and I am always sad as it begins to draw to a close. However, every season must end, and autumn, if it’s a mild one, can also be fantastic for hiking and savouring the spectacular colours of the deciduous trees and surrounding nature. I had heard that the Dovžan Gorge (Dovžanova soteska) had recently been somewhat updated with a new walking path and renovated bridges so I decided to go and check it out for myself. 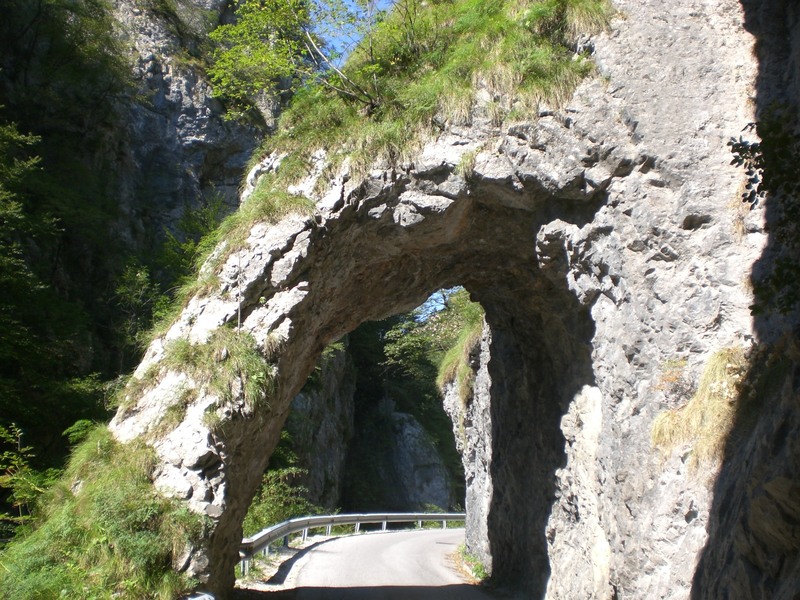 The Dovžan Gorge is located a few kilometres north of the town of Tržič, just a 20 minute drive from where I live in Radovljica. The waters of the Trziška Bistrica river have carved out the gorge, which is particularly known for its rich geological conditions and palaeontologic sites. 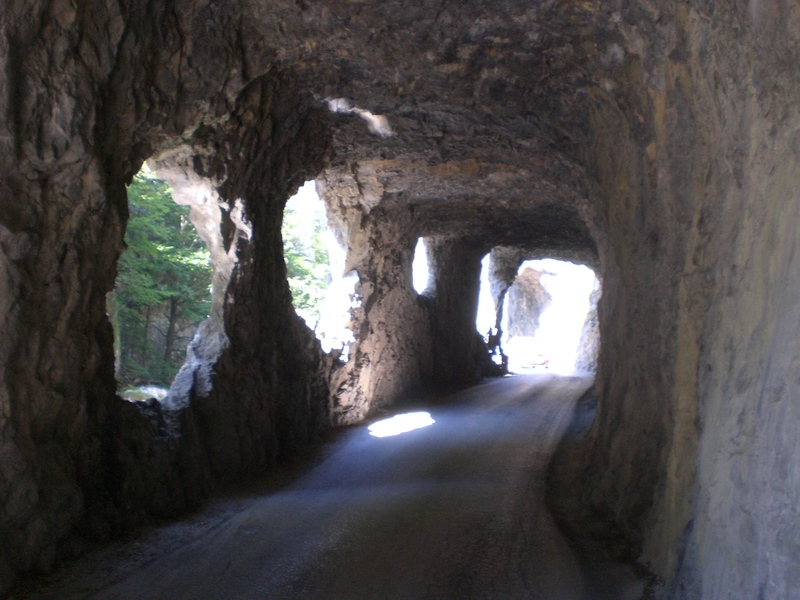 The tunnel at the entrance to the gorge, pictured below, was built on the order of Baron Born at the end of the 19th century. This effectively opened the gorge to the world as prior to this residents had to risk crossing a precarious suspension bridge, which was at the mercy of the raging waters. It is now possible to make a short circular walk in part of the gorge whilst the other parts lead beside the road. The circular walk, though short, is fairly challenging with ladders and steel grips here and there, so sturdy footwear is a must. This however can be avoided by continuing to walk along the road instead of crossing the river. 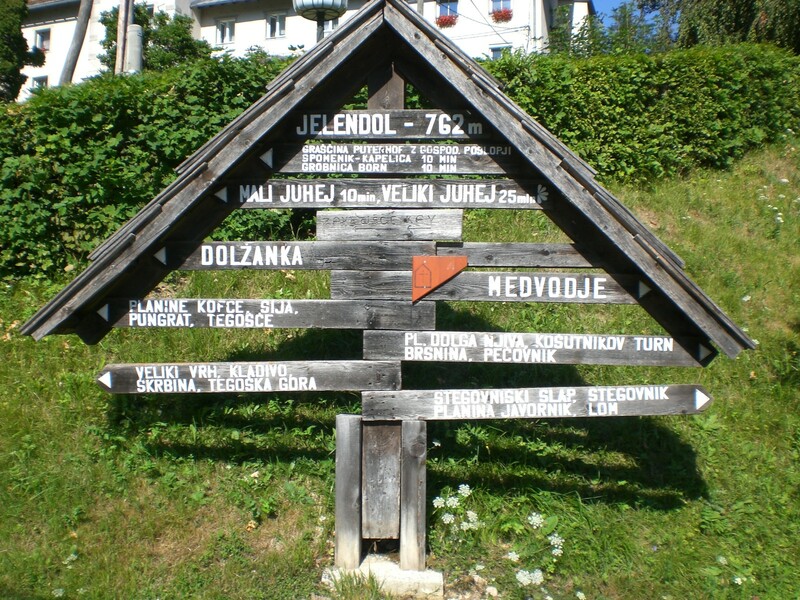 Those wishing to go a longer walk, as I did, can continue on the road to the village of Jelendol, which is home to the Born Mansion (Bornova graščina) and is also a starting point, as seen on the sign below, for numerous walks into the surrounding Karavanke mountain range; the peaks of Veliki vrh and Kladivo, the very popular Kofce highland and the Stegovnik waterfall. There is also an Exhibition and Educational Centre, in the village of Dolina. This weekend was Shoemaker’s Sunday (Šuštarska nedelja) in Tržič. I usually attend the event however this year, due to car problems, I wasn’t able to make it. The event, held annually on the first Sunday in September, is one of the largest of its type in Slovenia and brings the streets of the old centre of Tržič to life, attracting up to 10,000 visitors from all over Slovenia and neighbouring countries. The event was originally intended to showcase shoemaking in the area, with demonstrations and sales of products at bargain prices. These days however, there is a wide range of other products and stalls together with local food and an accompanying programme of entertainment.